Entrance to Palace of Charles V.
Among the four major sites to visit in the ancient hilltop fortress of the Alhambra in Granada, Spain, the easiest to access is the Palace of Charles V, as it is free. The Palace Nazare and Generalife Gardens require an advance ticket purchase (months in advance during high season! ), and the Alcazaba fort requires a combination ticket with either of the two. The Renaissance architecture of the very large Charles V Palace looks a little out of place among the 10th century, mostly Islamic Alhambra complex. 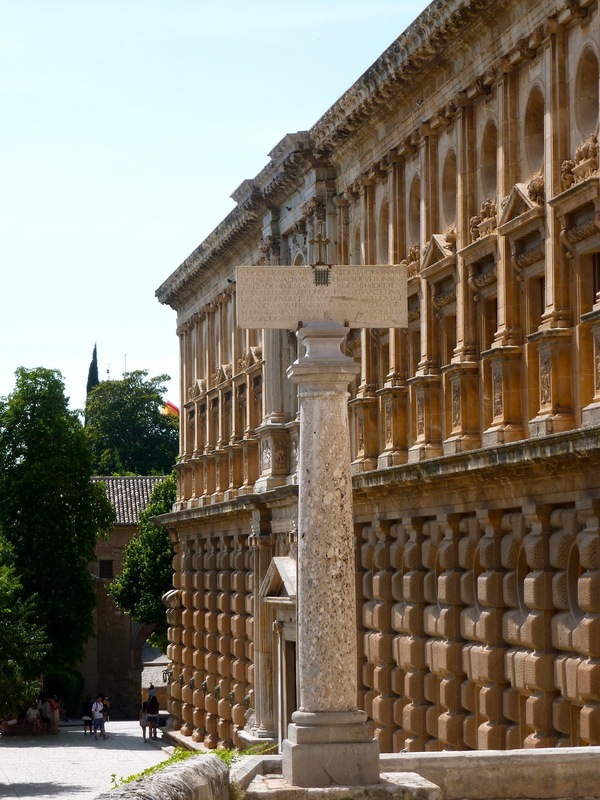 That's because the Holy Roman Emperor, Charles V, decided in 1527 that he liked the Alhambra so much, he wanted to live there, and so built himself the grand palace right smack in the middle of the grounds. It's an unusual building. The exterior is square, but upon entering, the visitor finds an open air, enormous circular patio. It is used today mainly as a theater, and was set up for the International Festival of Music and Dance when we were there. This is my link-up post to Photo Friday at DeliciousBaby.com. Read Alhambra Part 1: Generalife Gardens here. Read Alhambra Part 2: Palace Nazare here. Read Alhambra Part 4: Alcazaba Fort here. I could visit Europe just to see the architecture. It's so beautiful. I love all the curves in that first picture. Yet more beautiful photos from Spain! The Alhambra is very near the top of my list of must-see places! what a gorgeous palace and how awesome for it to be free. I love all the details in that entrance. The Alhambra is also on our travel bucket list.